BANGALORE, INDIA: RailYatri.in, a technology start-up focused on train travellers, has launched GPS train tracking platform, ‘RailRadar GPS’ to track and display the real time movement of nation-wide trains on a Google map. With this release, the train travel app has taken a step towards the longstanding train tracking challenge using smart location technology. 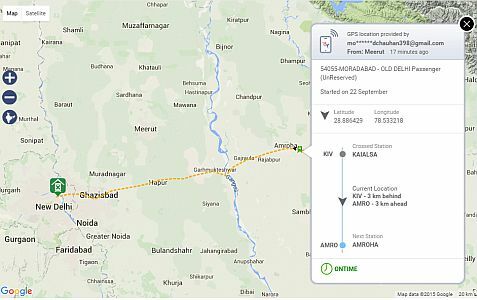 RailYatri’s ‘RailRadar GPS’ enables users to track running trains on a Google map along with its on-time/delay status. Real time train tracking continued to be a challenge despite crores spent on the pilot project which was scrapped after being launched on about 40 premium trains. The previous attempts by the government to install GPS on trains as part of the SIMRAN project failed due to the high project costs. But this uses a true crowd-sourced location tracking. ‘RailRadar GPS’ uses location generated by a passenger’s smartphone, the solution requires zero capital expenditure in terms of GPS hardware costs. The company has published around 100+ trains in the pilot phase. With hundreds of smartphones on each train nowadays, RailYatri’s RailRadar GPS has been designed to scale up to track every train in the country on a 24×7 basis. Users can click the train name from the map or search by train number and RailRadar GPS shows the exact location of the train in terms of latitude and longitude. RailRadar GPS shows trains running tracking data neatly displayed on a Google Map. The map also indicates the on-current time status of trains. Trains running on time have Green indicators, while those running late are marked red. It also shows the number of trains tracked at that point of time, and percentage of trains that are on schedule and delayed.